The past 40 years presented humanity with an amazing array of accomplishments and events. We’ve seen the birth of the Macintosh personal computer and the Nintendo Game Boy. We’ve witnessed the fall of the Soviet Union and the end of the Cold War. We saw the introduction of flat-screen televisions, iPhones, and J.K. Rowling’s Harry Potter novels. Through those four decades of rapid change, there is one thing has remained constant: The Canadian Gold Maple Leaf. And now, on the 40th anniversary of this long-running and popular gold bullion series, the Royal Canadian Mint has released its most epic Maple Leaf yet. Struck in a full ounce of highly-pure 99.99% fine gold, the 2019 Gold Maple Leaf features a special design that pays tribute to the milestone 40th anniversary. The Gold Maple Leaf’s familiar iconic design has been unchanged since the very first issue in 1979. Unchanged, that is, until now. The 2019 40th Anniversary Gold Maple Leaf intertwines the numeral 40 to create a spectacular tribute with radial lines gracing the background to create a vibrant effect. The $50 legal-tender coin also features a micro-engraved Maple Leaf mint mark, an elegant addition to an already-gorgeous coin that serves to thwart counterfeiters – and give you full assurance that you hold a genuine, government-guaranteed, high-purity gold coin in your possession. Standing front and center on the Canadian flag since 1965, the Maple Leaf has been Canada’s identifying image since the 1700s, signifying pride, connection and community. Since its introduction in 1979, the Gold Maple Leaf has become one of the most iconic and instantly recognizable coins in the world. And now you can bring home the 2019 installment of this beloved series with a spectacular 40th Anniversary design! 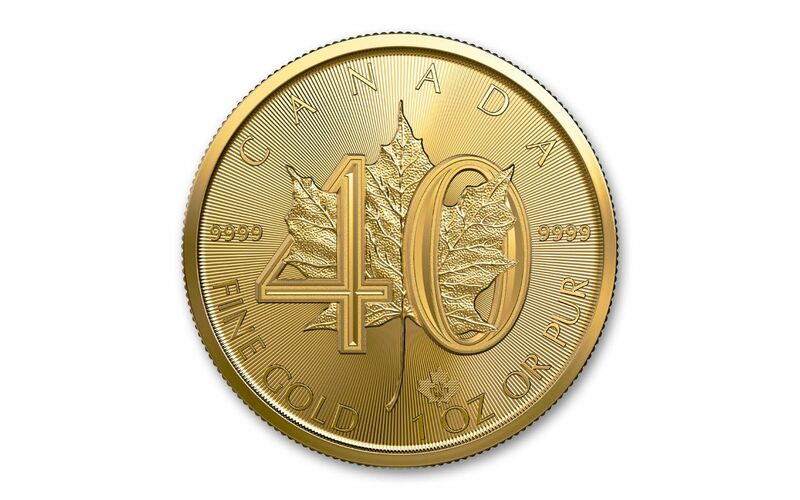 SPECIAL 40TH ANNIVERSARY DESIGN – Unchanged since the very first issue in 1979, the 2019 40th Anniversary Gold Maple Leaf intertwines the numeral 40 to create a spectacular tribute to this long-running and popular gold bullion series. Besides the new design, radial lines grace the background to create a vibrant effect. STRUCK IN HIGHLY-PURE GOLD – The artisans of the Royal Canadian Mint are known around the world for their craft. Beginning as a one-ounce planchet of high-pure 99.99% fine gold, each coin is struck to create bullion of exceptional quality. 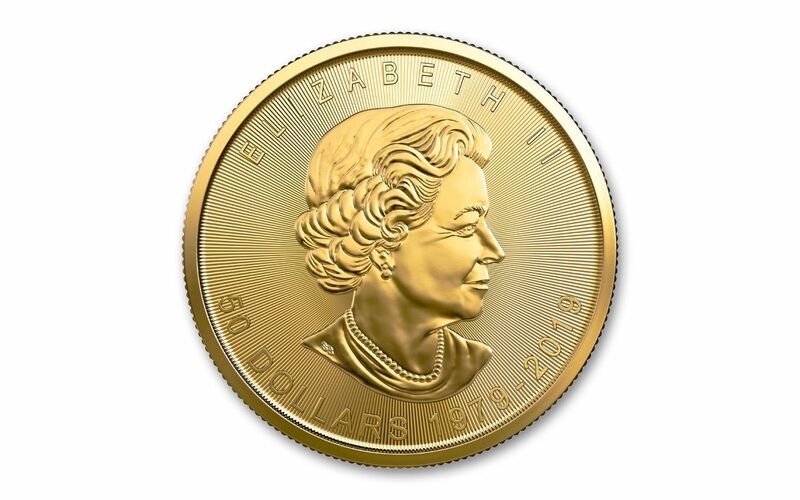 CANADIAN LEGAL TENDER – These 2019 Canada 40th Anniversary One-Ounce Gold Maple Leafs are $50 legal tender, confirmed on the coin's obverse along with Susanna Blunt's portrait of Her Majesty Queen Elizabeth II. BRILLIANT UNCIRCULATED CONDITION – Your 2019 Canada 40th Anniversary One-Ounce Gold Maple Leaf Bullion coin will come in gleaming Brilliant Uncirculated (BU) condition, as crisp and fresh as the day it left the mint. ADVANCED ANTI-FORGERY PROTECTION – Look below the coin's centerpiece and you'll discover another smaller leaf, a micro-engraved Maple Leaf mint mark. Along with the Maple Leaf's textured background, this elegant mark serves to thwart counterfeiters – and give you full assurance that you hold a genuine, government-guaranteed, high-purity gold coin in your possession. For four decades, collectors have clamored for each new annual release of Canadian Gold Maple Leafs. 2019’s special 40th Anniversary release is already looking to command just as strong of demand. Don’t wait to get yours – order one for your collection today!